Send with mail | ahoo instead. 6 × 6 = Required Please enter the correct value. The Fed's trend toward raising interest rates risks setting off these "debt-bomb" companies – those that have exploited low rates to borrow more than they should. The Fed has kept rates near zero for so long – mid-2008 was the last time the fed funds rate was as high as 1%. And companies may have assumed the lending-friendly environment would last forever judging by their high rate of borrowing. Back in 2008, U.S. corporate debt was about $3.55 billion. As of the second quarter of this year, it had grown 62% to $5.76 trillion. Over that same span, U.S. corporate profits have risen 45% from $1.06 trillion to $1.48 trillion. And despite the low rates, interest payments are up 40% since 2008. In other words, companies have added debt at a pace faster than their ability to service it. 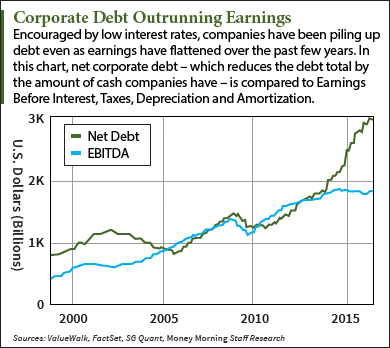 "Corporations are far more leveraged than they were on the cusp of the financial crisis," said Money Morning Global Credit Strategist Michael Lewitt. "Their precarious condition is disguised by eight years of zero interest rates. Now that the Fed is contemplating raising interest rates, their disguise could be ripped off." The danger of these corporate debt bombs is becoming more obvious even with low rates, and it's a global problem. So far this year 122 companies have defaulted worldwide – a pace not seen since 2009. And that's with near-zero interest rates. At this point it appears the Federal Reserve will lead the way in rate hikes, as the world's other major central banks show little stomach for changing course in the near future. That means U.S. debt-bomb companies are in line to go off in greater numbers as the Fed tightens. Right now the markets expect a rate hike at the December FOMC meeting. And the Fed members themselves, via the "Fed dot plot" they published in September, see interest rates rising past 1% next year, close to 2% in 2018, and past 2.5% in 2019. That's a big series of jumps from the 0.25% rate we have now. A steady drumbeat of increases will put a lot more pressure on overleveraged companies. 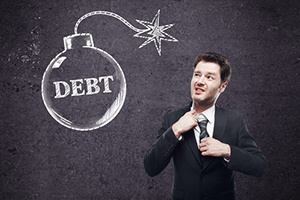 Not only will taking on new debt get much more expensive, so will refinancing old debt. "Bond and bank loan investors don't want to report defaults to their investors if they don't have to. So they are perfectly content to allow borrowers to 'extend and pretend' their loans until sometime in the future when they are forced to face the music," Lewitt said. Never miss a profit pick again. Choose from the topics below to receive our money-making recommendations in real time. Don't forget choose a topic. We respect your privacy. Learn more. Today, we found the best oil stock to buy that recently earned one of our top VQScores and is ready for a huge bounce back in the next few months. Money Morning gives you access to a team of ten market experts with more than 250 years of combined investing experience – for free. Our experts – who have appeared on FOXBusiness, CNBC, NPR, and BloombergTV – deliver daily investing tips and stock picks, provide analysis with actions to take, and answer your biggest market questions. Our goal is to help our millions of e-newsletter subscribers and Moneymorning.com visitors become smarter, more confident investors. © 2019 Money Morning All Rights Reserved. Protected by copyright of the United States and international treaties. Any reproduction, copying, or redistribution (electronic or otherwise, including the world wide web), of content from this webpage, in whole or in part, is strictly prohibited without the express written permission of Money Morning. You may choose from these hot topics to start receiving our money-making recommendations in real time. Interested in other topics? You can add more alerts below.